Such a great follow-up to Firelight, Vanish kept me on the edge of my seat.Jacinda, Tamra and their mother have been dragged back to the pride by Cassian. Maybe dragged isn’t the word, but they don’t go willingly. Tamra is not what she thought she was; now she’s possibly more valuable than Jacinda. Cassian is still determined to have Jacinda, and Jacinda, who thought she knew her own heart, now doesn’t know what to do. Oh the delicious teenaged angst!So the alpha of the Pride is pissed at Jacinda for leaving, and then endangering the pride by showing herself to humans, and hunters at that! (Like she had a choice, get off your high horse, kind sir!). Cassian wants to help her but he also knows Tamra is now a worthy mate with her newfound ability. Cassian has options. Tamra is no longer the black sheep of the pride now that she’s manifested. Jacinda is lost; used to being the pride’s golden girl, she’s now second to her sister, and in trouble, too.Interesting contrasts between the two novels: In Firelight, Jacinda doesn’t want to leave the pride, and feels safe and accepted there. 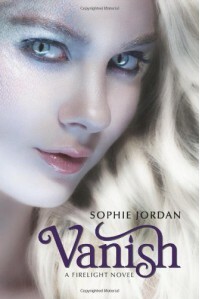 In Vanish, she would do anything to leave the pride, because she no longer feels safe and accepted there, but does feel safe and accepted by Will, her human love.There is more action in Vanish than in Firelight. As Jacinda decides she is going to leave forever, after the pride has decided her fate and broken her heart, Cassian’s sister stalks her until they are captured and taken. Thus begins an entire whirlwind of action in the story, that thrusts characters who don’t like each other together, for the sake of his sister and that of the pride.The world-building is great. Jordan is detailed in the descriptions of the pride village, right down to how the streets are set up, the lush landscape and the draki who inhabit it. It’s characters are also infused with a passion that is contagious to the reader; I certainly felt like I couldn’t read it fast enough!This is a fabulous series that strikes at the imagination and I can’t wait to read the next one.This review is also posted at Nerdhuffing.com.